There is a subset of fantasy literature which features a farmboy or a kitchen boy, often an orphan but always a boy, who dreams of being more and somehow joins a company on a great quest and discovers his own greatness (and often saves the world by fulfilling prophecy). Sheepfarmer's Daughter is not exactly part of that tradition, but it is in the same family. But, here's the trick: Paksenarrion is a girl and all she wants to do is become a soldier. The distinction here is vital, when we are thinking about where Sheepfarmer's Daughter fits in the realm of fantasy. Paksenarrion, or Paks, for short, has been told by her father that she will wed the neighboring pig farmer and so in return, runs away to join Duke Phelan's Company of mercenary soldiers. She had to walk the thirty miles to the next town, but she is eighteen years old, so is old enough to sign her own name and to begin to follow her dream of being a soldier. The rest of the novel follows her first three years of soldiering in the Duke's Company, or her training, friendships, losses, battles and marches. So much more than epic adventures, Sheepfarmer's Daughter is about the daily day to day slog of being a soldier. But, what's interesting there is that the majority of the characters, including Paks, do not have strong definable personalities or characterization that develops throughout the novel. Normally, this would be something to complain about, and likely many will. The overall storytelling, though, and the detail of the mercenary company going about their business (and later, having that business get personal) is all that is needed for Sheepfarmer's Daughter to work. 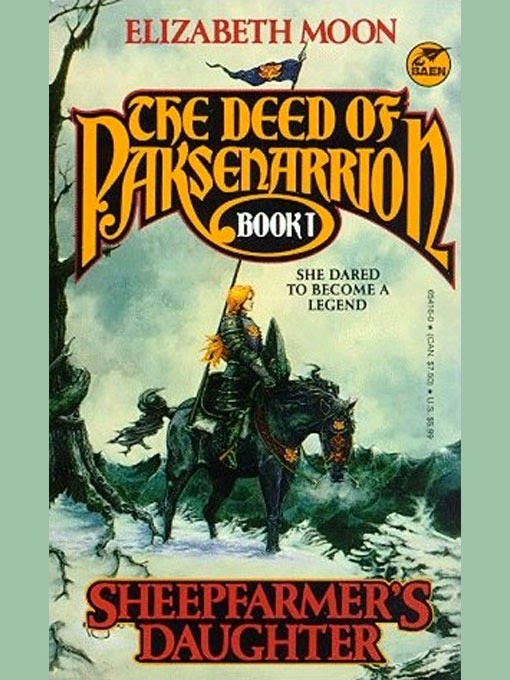 The other thing going on here is that Sheepfarmer's Daughter is the first volume in The Deed of Paksenarrion, which tells us that Paks is going to do and be something special. This ties back into how the novel is related to that kitchen boy fantasy, though only in the barest trappings. Also worth mentioning is that in the very first paragraphs, before even the first chapter begins, the father of Paks as an old man remembers the day that he received her two swords and a scroll detailing part of her life and adventures. And they always ask, the little ones who never knew her, what she was like. Just like that in the scroll? Always so tall, so brave? And Dorthan remembers her face the night she left, and is silent. One brother thinks of a long-legged girl running down errant sheep; the youngest remembers being carried on her shoulders, and the smell of her hair. Besides this, legend is all they have. Which actually gets to something that I thought about while reading Sheepfarmer's Daughter that I have never considered before in any other novel I have read. Paks thinks about sending some trinkets back home, returning the dowery price that her father had paid the pig farmer to marry her. It caused me to wonder about her family back in Three Firs. Not so much about what their lives were like, but more about how they were feeling about not knowing whether Paks was even still alive. During many battles and marches, there were close calls and injuries and illnesses and that Paks does live through this first novel (not a spoiler) is something beyond luck given how many of her friends and fellow soldiers died. Does her father regret pushing her into a marriage he knew she didn't want? Were her brothers angry or proud, learning that she left? Does her mother stay up late each night, waiting beyond hope that she might come home? This is seldom addressed in fantasy novels or adventure novels or really in most novels where the rest of the family is left at home. Do they worry? Do they fear? They must. That opening passage suggests that life does go on, and that the family did talk about her, and that silence of Dorthan holds personal regret and pain that their last parting was in anger. But, that is the sort of thing that you think about reading Sheepfarmer's Daughter. Or, it is the sort of thing that I thought about. Sheepfarmer's Daughter is the first entry in life of Paksenarrion, in The Deed of Parksenarrion, and for much of this novel Paks is no more than she knows herself to be: a simple woman who loves to be a soldier and wants nothing else out of life. I can't say what sort of reception Sheepfarmer's Daughter received in 1988, but it was successful enough for Elizabeth Moon to continue to publish novels with the same publisher and for her to be able to write more books in this same world (both from the direct series, as well as subsequent related volumes). But, in the intervening decades I feel that it has slipped from the conversation of top fantasy novels where acclaim and conversation have gone in different directions. Some of this may just be from my own perspective and there may well be a dedicated community that praises this and Moon at every turn of the clock, but Sheepfarmer's Daughter still seems to be absent and overlooked. It shouldn't be. While giving the appearance of being epic fantasy in the more traditional sense, Sheepfarmer's Daughter as a first volume (and debut novel) seems to fit more in the vein of military fantasy - but with a strong sense of realism. It is more akin to The Black Company than with a macho testosterone laden fantasy that comes to mind when "military fantasy" is thought of. This is good, folks, and I think it would be awesome if it was more read and discussed. I'll be very interested to see how the story develops in Divided Allegiance and how it is different, because from the end of Sheepfarmer's Daughter, there is a strong sense that this is all about to change for Paks. I think you should go look at the fan community for Paksworld- Moon developed other characters in these novels and is in the moddle of a series about Kieri Phelan now.